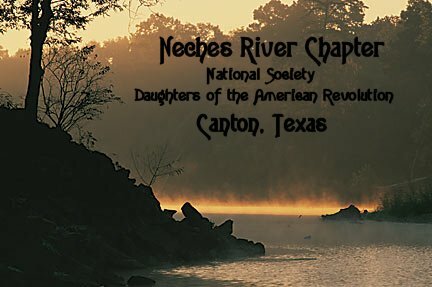 The Neches River Chapter, NSDAR, is named in honor of what is sometimes called "East Texas' last wild river." The Neches has been flowing through Texas longer than any of the remnants of mankind, even the earliest Indians. The river was supposedly given its current name by Spanish explorer, Alonso De Leon, who names it for the Neches Indians, one of the Caddoan tribes he encountered. Despite the efforts of the Spanish to colonize the river basin, white settlers did not enter the region until the 1820s. When Mexican official, General de Mier y Teran, was sent to the region in 1828, he found numerous Anglo American settlers, who used hand-driven ferries to cross the Neches and open the region to settlement. General Teran built a fort on a bluff of the Neches near present-day Rockland, in Tyler County, to serve as a Mexican outpost in the region. The Mexicans supposedly operated a lead mine on the bluff until the fort was abandoned. The exact site of the fort remains unclear. On his first trip to Texas, Stephen F. Austin wrote, in 1821, that the Neches "affords tolerable keel boat navigation." Barges were used to float cotton and other farm produce to Sabine Bay in the 1830s and 1840s, and steamboats began to travel up and down the waterway in the late 1840s. Some of the earliest steamers included the Angelina, Florida, Frankie, Katy, Laura, Neches Belle, Pearl River, and Star. Scattered up and down the length of the river are remnants of history, including old river ports, logging camps, sawmill ghost towns, ferries, and Republic of Texas landmarks. We meet on the second Thursday of the month September through May. Please feel welcome to inquire about DAR membership. Social time is 6:30 p.m. and meeting time is 7:00 p.m.